JUST OPPOSITE my hotel is the building below, framed as you can see, by coconut palms. Just seconds before and not pictured here is the guy who scales these trees for ripe coconuts. He takes a good look around to see if the fruits are ripe, then shimmies up the trunk to pick the nuts and throw them in his back sack. You might have met Innomedia before, wrote about the company in the INQster last year. 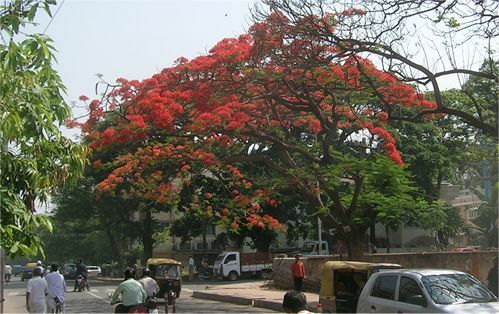 And at the t-junction there’s a tree ablaze with red blossoms. This, we’re pretty sure, is a Tamarind tree – the flowers give way to pods, each containing three or four seeds which are used in cooking. Tamarind tastes an awful lot like lemon. 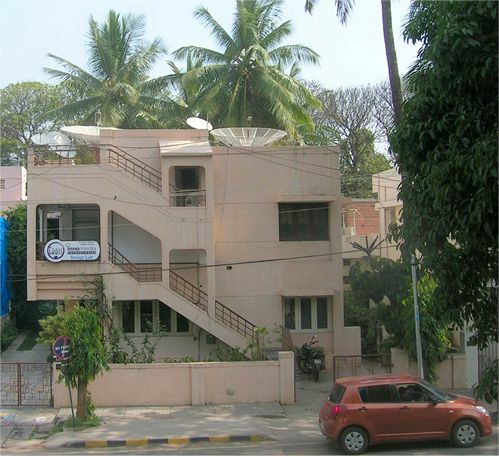 This entry was posted in Uncategorized and tagged Bangalore, Bengaluru, coconut, Tamarind. Bookmark the permalink. That should be a gulmohar tree .. definitely not tamarind .. you can find lots of those in B’lore.